Screened by our rigorous background check and interviewing process. Trained with the best available instructors and courses. Equipped with up-to-date and sophisticated gear and tools at their disposal. Managed by experienced and well-educated leadership, comprised of Armed Forces veterans and long-time Security Professionals. And working together in a team-based and incentive driven workplace environment. Staff members must be in constant communication for effective operational capacity. To ensure maximal and optimal performance, staff members are equipped with company provided 2 way radio cellular devices loaded with a specialized tracking and reporting software, and are required to report-in every 15 minutes. Dispatch tracks and monitors each and every movement, field-report, incident, and composes a full-scope documentation for our clients same day. Unlike other agencies, all of our staff, including management, are required to undergo several hours in Use of Force training, CPR & First Aid, Non-Violent Crisis Intervention, reporting taking and various self defense courses. We also require all new field agents to be accompanied by a FTO (Field Training Officer) for a period of 30 days prior to being allowed to operate on our clients property. In doing this, we can insure that all of our people meet our clients expectations and understand what is expected of them. All of our staff are in constant communication with our control center. This allows our agency to effectively respond to emergencies, alarms and client requests within seconds of receiving a call for service. Our agency regularly conducts intelligence operations to ensure the agency and our clients stay competitive in the markets. We also conduct these operations to help improve our services to our customers. As part of our continued commitment to protecting our clients, all of our services include these operations at no extra cost. Our Security Agents are fully equipped with the gear they need to perform and exceed in their duties. 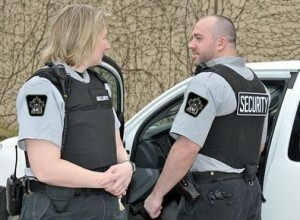 Consisting of a 3-Tier system of low to high profile assignments, our Security Agents may carry batons, handcuffs, Bullet proof vests, 2 way radios, high or low viability uniforms, surveillance tools, non-lethal defense options, mobile tracking devices, cellular communications, flashlights, keys, and anything else necessary.